We have hooked up with Slots LV to offer our players an awesome Exclusive Slots LV No Deposit Bonus and First Deposit Signup bonus for Slots LV. What’s more is you’ll also receive a $22 Free Chip Bonus just for signing up, as our gift to you! So get ready to kick back and enjoy Slots LV stellar casino games, huge weekly bonuses, endless perks and lightning fast payouts. See below for a list of different options you have when signing up. If you have any questions please do not hesitate to contact either VGN Support or Slots LV Support. To qualify for the Slots LV No Deposit Bonus a player must redeem the coupon code SLOTS22. SLOTS22 coupon is intended for new players only who have not yet made a real-money wager. Any wins on this coupon from players who do not meet these criteria will be null/void. 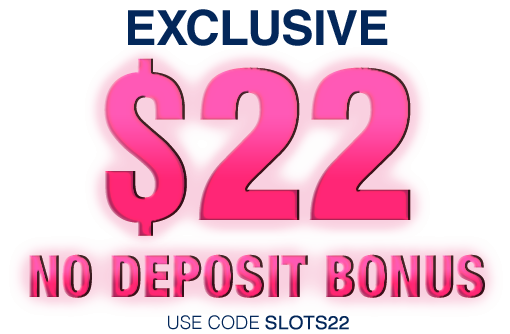 The $22 No Deposit Bonus is subject to 100X playthrough, as well as a maximum withdrawal amount of $125 on winnings. Any winnings above the $125 based on the bonus will be forfeited upon cash out. No Comp Points can be accrued based on play that results from the $22 No Deposit Bonus. Only activity after the coupon has been redeemed counts toward the bonus requirements. Forfeiting this bonus will result in this bonus and any subsequent winnings associated with this bonus to be removed. Only play on slots, keno and Scratch cards counts towards playthrough requirements for withdrawal, play in any other game while the bonus code is still active will void all winnings. The general rules and policies of Slots.lv and standard Terms and Conditions shall also apply to this promotion. You may also be required to provide documentation proving your identity and that your account information is accurate before being able to cash out your winnings. The $5,000 Welcome Bonus (“Promotion”) is valid from October 20, 2014 at 00:00:01 AM ET. The Promotion consists of one (1) 200% match bonus up to $1000 and eight (8) 100% match bonuses up to $500 each, to be used to play slot games. This offer is valid for first time depositors only at Slots.lv. The first bonus code, HELLOSLOTS200, can be redeemed once per player and the second bonus code, HELLOSLOTS100, can be redeemed up to eight times per player. The maximum value of the Promotion per player is $5,000. To acquire the maximum bonus amount, the player must redeem the bonus code HELLOSLOTS200 and make a subsequent deposit of $500 or more, then redeem the bonus code HELLOSLOTS100 and make a subsequent deposit of $500 or more (eight times). When one code has been redeemed, the player must meet the playthrough requirements before being able to redeem the subsequent codes. Only activity following code redemption counts towards fulfilling the bonus requirements. The deposit plus bonus amount is subject to a 35X playthrough requirement before the deposit, bonus amount and any winnings can be withdrawn. Only play on slots, keno and scratch card games counts towards meeting playthrough requirements for withdrawal. Play in any other game will void all winnings won on this promotion. The general rules and policies of www.slots.lv shall also apply to the Promotion. Slots.lv has the right to cancel or withdraw the Promotion or change any of its terms at any time and without cause or notice.